When the reverse of a case is not shown in a picture it is assumed to be plain unless otherwise noted. "ABDUL KADERS AHMEDABAD 6LEVER". Iron case with high nickel content. Brass shackle. The following are superficial facts that may or may not be applicable to this padlock: Ahmedabad is the 6th largest city in India, founded in the 15th century. Abdul and Kaders are both names used in the region. (I-5). "BEST 6•LEVER" - Elliptical Shackle Opening - Brass Plated. 2.690" high x 2.319" diameter x .628" deep. These locks were made with the following finishes: Brass plated, Nickel plated, and Copper plated. 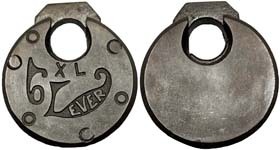 The Padlock has a medium high shackle. Mfg by: J. Walter Miller Lock Co. (I-11). 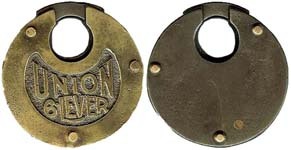 "DASH 6LEVER". 2.572" high x 2.348" diameter x .667" deep. Some padlocks are brass plated. (I-14). "DORPIAN 6 LEVER". Made for: Clark Witbeck Hardware Co. (I-14.5). 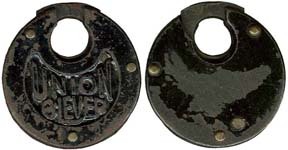 "DUKE 6 LEVER". 2.524" high x 2.334" diameter x .639" deep. Mfg by: Safe Padlock & Hardware Co. (I-15). "MONROE 6 LEVER". Made for: Monroe Hardware Co., Monroe Louisiana. (I-19). "R B & R 6 LEVER". Made for: Reilly Bros. & Raub Hardware Co. (I-21.5).